GoDaddy is the biggest Internet domain registrar and web hosting company that also deals with e-business related software and services. It is currently the largest ICANN-accredited registrar in the world, and is three times the size of its closest competitor. We are sharing a special Promo code that will help you get a new Domain name for just $0.99. This offer is limited for FIFA World Cup 2010 season. Use the coupon code SOCCER99 to avail the discount. You can use this code only once per account. And credit card is required to complete the payment. 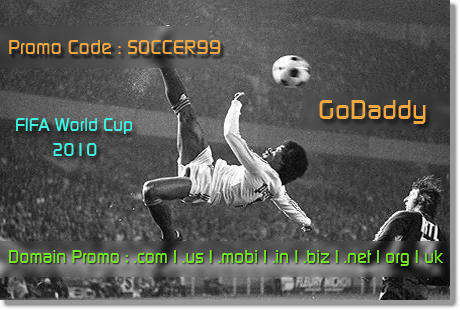 This is the special promotion offer for the FIFA world cup 2010 and it is limited both by time and number of domains. So guys, hurry up if you interested!